Sakai Guides and DocumentationFaculty Guide Create Online AssessmentsHow do I grade Tests & Quizzes? If you would like to send your assessment scores to the Gradebook so that they can be included in the course grade calculation or allow students to see an answer key or other feedback in Tests & Quizzes, see What are the Grading and Feedback options for an assessment? On the Total Scores screen for an assessment, you can see the total score each student received based on the points from auto-graded questions (such as multiple choice and true false). 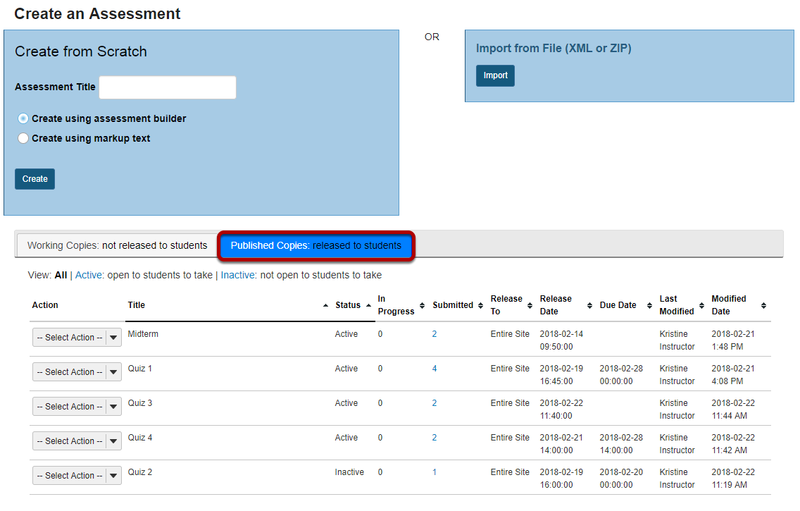 You may adjust the students' scores and for students who submitted the assessment, you can add comments. Tests & Quizzes will NOT automatically grade students with no submission. If a student who did not submit an assessment should receive a grade of 0, you'll need to enter a 0 for their grade. Comments cannot be added within the Tests & Quizzes tool for students with no submission and they do not have access to feedback for assessments they did not submit. If you'd like to print an answer key to an assessment to provide to students who did not submit, see How do I print an assessment (i.e. test or quiz)? Once a grade has been saved for a student in Tests & Quizzes, you cannot delete the grade to remove it from the student's course grade. If you inadvertently assign a score to a student who should not have received one for an assessment, and the assessment score is being sent to the Gradebook, you may need to override the course grade in the Gradebook. Next: How can students avoid problems when taking online tests?